I love this dish. It is simple and tastes sooo goood. It does take about an hour to make, so it may not make a good week night dinner, but it is sooo worth it if you have the time. Nice moist chicken, crispy skin, zingy sauce. Yummmm. I typically use a pan that can go from the stove top to the oven (I am usually cooking for 4 or less). But if you are cooking for more or do not have a saute pan that is oven safe, you can do the searing on the stove top and then transfer to an oven save pan. But don’t go washing that saute pan just yet, that will be used to build the pan sauce. It is important to be able to check the temperature of the chicken. If you do not have one, a you can get a quick read thermometer for a low-cost. Chicken should be cooked to 170 – 175 degree internal temperature, or when the juices flow clear if you cut into it and it is no longer pink. Don’t forget that once you remove the chicken from the oven, it will continue to cook while it rests. Giving the meat about a 5 minute resting period is important. So with this, removing the chicken at about 170 will make sure you have a moist and fully cooked chicken. If you remove at 175 or higher, the chicken will most likely be dry. Don’t be afraid to cut into a piece of chicken to double check. You want to be safe with chicken. Prep the chicken: Make a pocket in the skin of the chicken. Sprinkle the inside with a little salt and pepper, and place 1 – 2 slices of lemon, 4 – 6 slices of garlic, and 1/2 of a sprig of the thyme and a 1/4 sprig of oregano into the pocket. Repeat for all chicken pieces. Then salt and pepper both the top and bottom of the outside of the chicken. Heat a large saute pan on the stove at high/med-high and add the olive oil. The pan is ready when the olive oil starts to simmer. Turn on your exhaust fan. Add the chicken to the pan SKIN side down. Let the chicken sear and brown on the skin side. When the chicken releases easily from the pan, flip for 1 minute. Place the pan in the oven. **Be Sure to USE Oven Mitts when checking in on the chicken or touching the pan. I have learned that lesson well. Because it is a saute pan, I just naturally want to grab it with my hand. Roast the chicken in the oven until the internal temperature reaches at least 170 degrees or the juices run clear and the meat is no longer pink. About 40 – 45 minutes. 6. In a medium sauce pan, add the white wine, lemon juice, chicken stock, garlic and remaining fresh herbs. Bring to a low simmer and let simmer for about 10 – 15 minutes, reducing the liquid by about 1/3 or 1/2. It doesn’t have to be exact, this time will allow the flavors to extract while the chicken is cooking and reduce the pan sauce time. After 10 – 15 minutes, set aside until the chicken is done. Note: Remove the pan (USING OVEN MITTS now and every time you touch the pan handle, can you tell I have been burned a few times?) and return to the stove over med heat. Check to be sure the chicken is done. Then remove the chicken to a serving dish or plate to let rest (Away from heat). 7. While the chicken was cooking and the skin getting nice and crispy, much fat was rendered (released). The pan will have an excess of fat. Remove all but about 1 – 2 TBS of the fat depending on the size of the pan – you want the bottom of the pan to be covered. Be sure to keep all the little bits in the pan. Just remove the fat. 8. Add the contents of the sauce pan to the saute pan to deglaze it. Immediately the liquid will sizzle and bubble – that is good. Use a spatula to scrape up all the wonderful bits on the bottom of the pan. Let simmer for about 2 minutes. Remove the herb sprigs and discard them. 9. Mix 1 TBS of flour with about 2 – 3 TBS of water, shake and mix until all lumps are out (this is called a slurry). Add more water if needed to reach a thin pancake batter consistency. 10. Allow the sauce to reduce for another 3 minutes. Then add in 1/2 the butter. Stir to mix well. Now taste. You really should not have to add any more salt or pepper. Keep in mind, the meat was seasoned. If you can – sneak a piece of the chicken meat to taste for saltiness. This will help you adjust the salt level of the sauce. If the chicken is salty enough, don’t add salt. If the chicken is not salty enough, add a little salt to the sauce. If too lemony, add more butter. 11. So now you have the flavor you want, let us get to the consistency. This is where our flour slurry comes in. While whisking the sauce, slowly pour in 1/2 the slurry until it is fully mixed into the sauce. Let simmer for a minute or two (doesn’t take long to thicken) and continue to whisk. Taste again and check for thickness. If it is the thickness you want, your are done. If not, add the remaining slurry. 12. Take off the heat and serve the chicken with the sauce within a couple of minutes. If sitting for more than a minute or two, be sure to stir or whisk the sauce to keep it from forming a skin on top. Let the chicken sear and brown on the skin side down. When the chicken releases easily from the pan, flip for 1 minute and move the chicken to the oven safe pan and continue with the remaining chicken. When all chicken is done, place the pan into oven. 6. In the same saute pan used to sear the chicken, remove all but 1/2 TBS of the fat. Heat over med heat then add the white wine, lemon juice, chicken stock, garlic and remaining fresh herbs. using a spatula, scrape up all the wonderful bits and bring to a low simmer and let simmer for about 10 minutes, reducing to about 1/3 – 1/2. Set aside until the chicken is done. 7. While the chicken was cooking and the skin getting nice and crispy, much of the fat from the skin was rendered (released). The pan from the oven will have an excess of fat. Add 1 – 2 TBS of that fat to the saute pan with the sauce. 8. Re-heat the pan with the sauce ingredients over med-high heat.and bring to a simmer. Let simmer about 5 minutes, then remove the fresh herb sprigs. A nice rice pilaf will be great, especially to sop up all that wonderful sauce. It is simple and easy to do and can be started during step 6. In a med sauce pan, add 1 TBS butter, 1/2 cup chopped onions, a couple twists of pepper, 1 garlic clove minced and saute for about 2 minutes until onions are just getting soft. Add the rice and toss for about 30 seconds, then add the water (or substitute chicken stock for the water) according to the rice directions. Once the rice is done, stir in some fresh diced scallions or fresh herbs. Asparagus, green beans, broccoli, and melody of veggies al work great. Steaming is very easy. If wanted, once cooked to your desired doneness, toss with a little olive oil (or butter) and sprinkle with a pinch of salt and pepper. To make this low sodium – omit adding the salt in all steps, the flavors will still be wonderful. 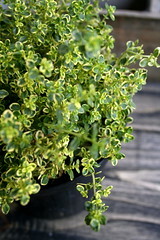 If you buy fresh herbs – there are many things you can do if you do not use them all at the same time. I have another blog entry Pesto: What to do with all those left over herbs that provides other uses or ways to keep herbs for future use so there is no or little waste. To reheat – Heat the remaining sauce in the pan, cut the chicken off the bone (discard skin) into strips and toss in the sauce until heated through. Serve over the rice. OR – cut the chicken off the bone, toss with pasta, fresh herbs, the remaining sauce and remaining vegetables for a one pot dish. Heat until just warmed through. OR – Cut the chicken off the bone and have a great sandwich. You can mix some of the sauce with a mayo to give a lemon kick to the mayo, add some lettuce and tomato. You can turn this into a panini as well. If you want cheese, a nice provolone, sliver of fresh parm or goat cheese would all work. OR – Cut the chicken off the bone and use it to make great chicken tacos. Use a fresh salsa vs the typical jarred salsa. Most grocery stores sell this in the salad section. ENJOY – My favorite part is the crispy skin! Posted by culinaryease on August 26, 2011 in Cooking for two or less, General Cooking, Recipes and tagged Chicken, Herbs, lemon, lemon chicken. This one I think we will have to try Sunday when I have more time. I will let you know. Sounds good.